Nehru Planetarium is located near Chankyapuri Area in New Delhi in Teen Murti Bhawan. Nehru Planetarium Delhi was named upon on first Prime Minister of India Mr. Jawahar Lal Nehru. It is located in the green campus of Teen Murti Bhawan. Teen Murti Bhawan was the official residence of Mr. Jawahar Lal Nehru and it is officially known as the Nehru Memorial Museum and Library. Jawahar Lal Nehru Memorial fund was set in 1964 to promote his ideas. Nehru Planetarium is also known as Nehru Taramandal. Nehru Tara Mandal is a place to teach more about astronomy. Here visitors can learn more about our universe, solar systems, galaxies, sun, stars, planets, asteroids, satellites, etc. Various space prototypes are also shown here on display which will surely increase visitors’ knowledge. India’s first Satellite Launch Vehicle SLV 3 also displayed here. Sky Theatre is the main of Nehru Tara Mandal, it is a dome shaped theater where visitors can enjoy the space show on their recliner seats. The screen of Sky Theater is made of glass fibre and it is installed on the dome, it gives a view of 180 degrees. Watching a show in the Nehru Planetarium on Sky theater will give you a feel of open sky full of stars, galaxy, planets, etc. The seating capacity of sky theater is about 270 seats. Nehru Planetarium timings are 9 AM to 5 PM from Tuesday to Sunday. Taramandal remains closed on every Monday. Two to three hour visit is sufficient to visit if you want to watch the show at Planetarium. Everyday total four shows are played in the planetarium in Hindi and English languages. Duration of each show is around 30 to 40 minutes. Both the solar system and celestial show are played in English and Hindi language. Additional sky show is run on Sunday at 12.30 PM depends on the crowd. 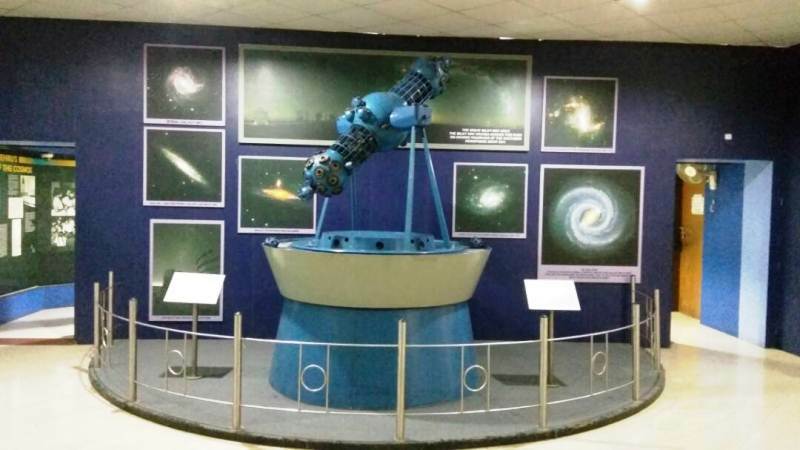 Nehru Planetarium attracts maximum number of visitors on Sunday and Saturday. More than 200,000 visitors visits Nehru Planetarium every year. Special shows for school students and organizers can be arranged on advance special request. 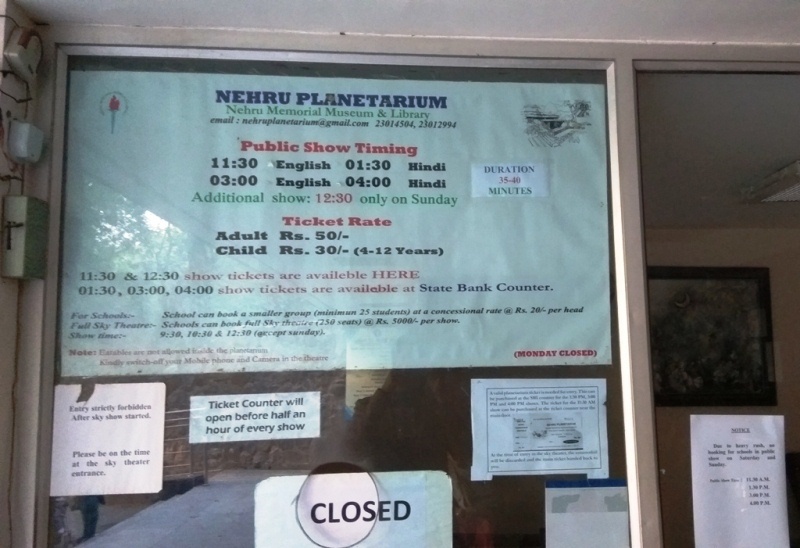 Nehru Planetarium entry fee is fairly priced. Adults can get an entry in the Tara Mandal by paying a amount of 50 rs for ticket. Child entry ticket is 30 Rs for age between 4 to 12 years. Concessional tickets are available for school students at discounted price of 20 Rs per head. Delhi Meto is the best way to reach at Taramandal. Nehru Planetarium Delhi Nearest Metro Station is Race Course Metro Station (Lok Kalyan Marg Station). Metro station is just 2 KM away from the Nehru Taramandal. rest of the journey can be covered via DTC bus, auto rickshaw, ola, uber cab, etc. Chanakya Puri Police Station and Teen Murti are the nearest Bus Stand, both bus stops are just few meters away from the Planetarium. Parking facility and Washrooms are available in the planetarium, however parking might be insufficient during the Sundays or on Holidays. Use of Mobile and Cameras inside the theater is strictly prohibited. No arrangements of online tickets of planetarium till now. Ticket queue is little bit longer as compared to weekdays, so plan accordingly. It is also pronounced as Nehru Taragan, it is a good place to visit in Delhi with kids, they will surely enjoy the place. This place will help in increasing the general knowledge of kids as well as their parents. Places to visit near Nehru Planetarium are National Rail Museum (3 KM), India Gate (4 KM), National Science Museum (6 KM), Old Fort (5 KM) and Delhi Zoo (5 KM).